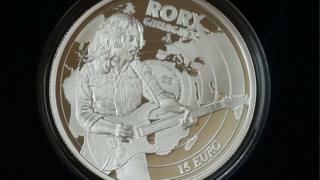 A new commemorative coin has been launched marking 70 years since the birth of Irish rock and blues legend Rory Gallagher. The €15 silver proof limited edition coin has been issued by the Central Bank of Ireland. It is the first in a 'Modern Irish Musicians' series that will also commemorate Phil Lynott and Luke Kelly. Gallagher was born in Ballyshannon, County Donegal, and spent part of his childhood in Londonderry. He died in June 1995 at the age of 47. Mr Gallagher's brother, Dónal, told BBC Radio Foyle: "Rory would have been very modest about all of this and stayed in the dressing room and not come out. "But he really would be honoured and proud too at the same time. "Rory made classic music and he didn't follow whatever was fashionable. I remember producers asking him to use certain gimmicks and he always declined. That's what made him stand out." The first coin, featuring the guitarist and his trademark Fender Stratocaster, was presented to Irish president Michael D. Higgins on Monday. He said Gallagher was "one of the greatest musicians in the history of our country - and certainly the greatest guitarist in our history." "Indeed, so complete was his mastery it is now impossible to mention the Fender Stratocaster without thinking of Rory Gallagher," he added. Gallagher first made headlines with his band, Taste, in the late 1960s. When Jimi Hendrix was asked how it felt to be the world's greatest guitarist, he is reported to have said: "I don't know, go ask Rory Gallagher". He was very popular in Belfast where he played regularly through some of the darkest days of the Northern Ireland Troubles. Gallagher's albums have sold more than 30 million copies globally.